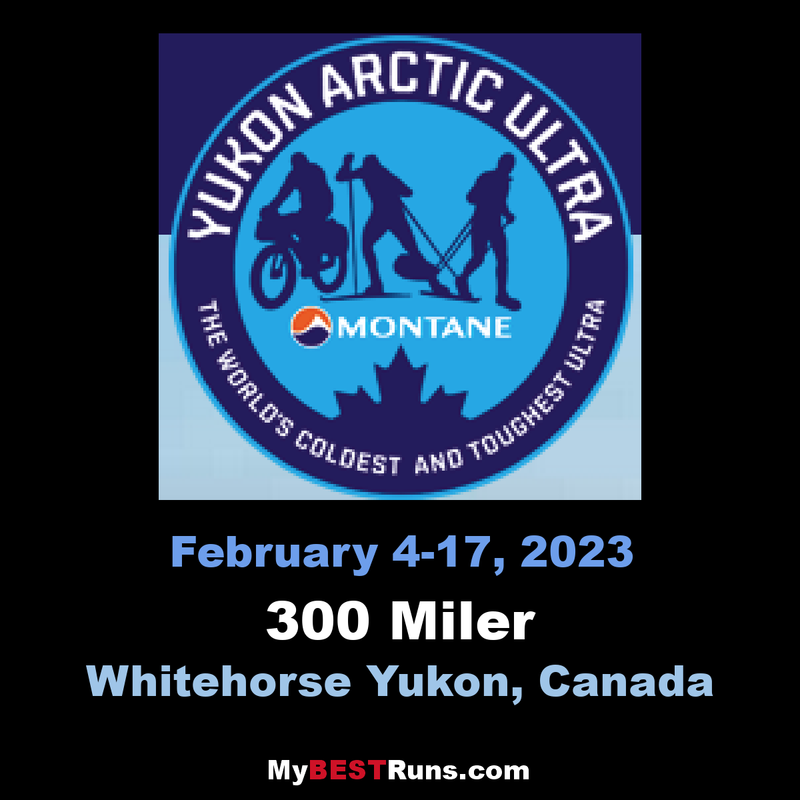 The Yukon Arctic Ultra is the world's coldest and toughest ultra! Quite simply the world's coldest and toughest ultra. 430 miles of snow, ice, temperatures as low as -40°C and relentless wilderness, the YUA is an incredible undertaking. The Montane® Yukon Arctic Ultra (MYAU) follows the Yukon Quest trail, the trail of the world's toughest Sled Dog Race. Where dog teams once slid and scrambled now human power chases up the trail. Choose to race the 430 mile, 300 mile, 100 mile or marathon distance either by snow mountain bike, cross country ski or by foot. The race begins in Whitehorse, Yukon, finishing (for those that make it) 13 nights later on the in Dawson, Yukon. The marathon finishes just off the Takhini River. The 100 mile competitors race from Whitehorse to Braeburn. The 300 mile racers continue relentlessly onwards going all the way to Pelly Farm. 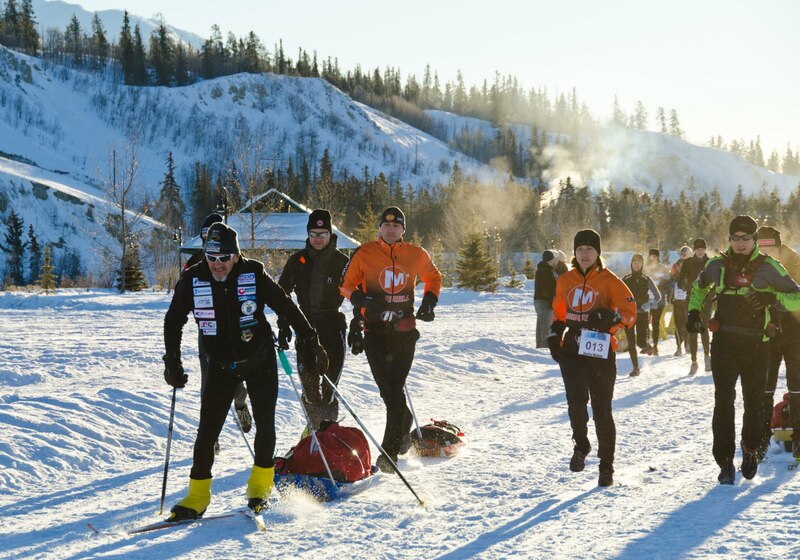 The 430 mile athletes continue on up the Quest trail to Dawson City. The race trail is marked, however, fresh snow or a lot of wind can obliterate the route leaving it difficult to find the way. The threat of frostbite hangs over you like the sword of Damocles. The hours of darkness are brutally long clouding your judgement and playing with your mind. You struggle to eat enough to provide the fuel your body craves. Sleep is limited and you're alone, solo in a vast empty cold wilderness. The MYAU differs from the Marathon Des Sables and the Jungle Marathon in that there are no crews waiting at checkpoints to deal with aches and pains. You get food, encouragement and are told - if you have enough psyche - to get back out into the snow and race to the finish. The Montane Yukon Arctic Ultra will follow the Yukon Quest trail, the trail of the world's toughest Sled Dog Race. The marathon finishes on Rivendell Farm just off the Takhini River. The 100 mile racers will go from Whitehorse to Braeburn. The 300 mile racers will keep on going all the way to Pelly Farm. There they will leave the river to turn around and go back to Pelly Crossing on the farm road. The 430 mile athletes will not return to Pelly Crossing. Instead they will continue on the Quest trail to Dawson City. 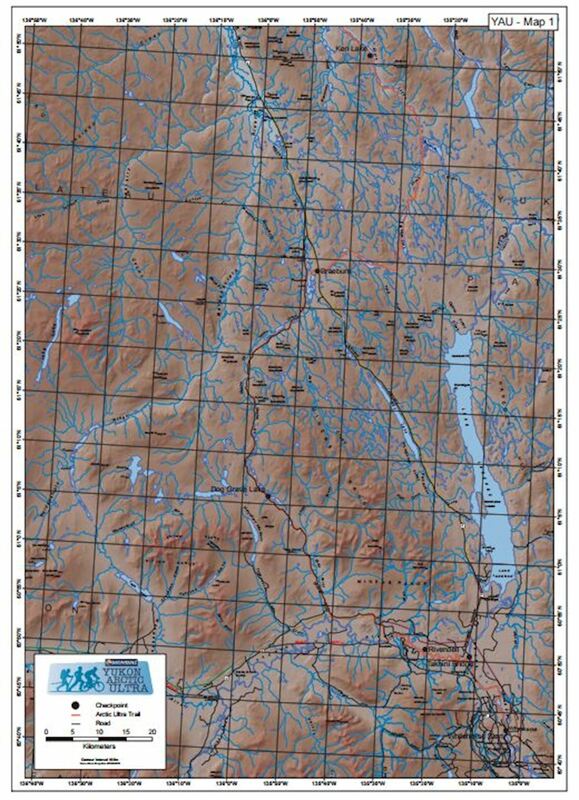 The new 200 mile race will start in Pelly Crossing and finish in Dawson City. From the start line the athletes will get on to the WhitehorseMillennium trail which leads along the River in a northerly direction. Soon athletes have passed the downtown core of Whitehorse and the trail veers of to the right to go onto the river ice of the frozen Yukon River. Clear markings with Quest markers and spray paint will indicate the turn-off from the river ice. The trail leads from the river up on to snow covered farm land. It is important to stay on the marked trail otherwise you may destroy plants that areburred in snow. Our little checkpoint is only about 200meters away. There will be a fire to warm up and dry your shoes and other items. However, if everyone gets there at the same time it may be a bit crowded. This trail is dating back to the Gold Rush era and has been used since by trappers, and more recently by recreational snowmobilers. Some years ago, the trail was formallyrecognized as part of the Trans Canada Trail. With this new designation, the trail underwent considerable upgrading. The clearing and trail-markers contribute to making this a better trail. Between mile 3 and 9 on the Dawson Trail there will be several branches off the main trail. All turn offs will be clearly marked and the tracks of the lead snow machine will give additional indication of which trail to take.Generally all turns in this section will be to the right. As the first section follows an active part of the road and crosses at two locations, care should be taken not to conflict with local traffic. Since the trail goes over watersheds, several gradual and at times steepclimbs should be expected. It can be narrow and winding at times and you will cross several small creeks. Overflow is often frozen but be prepared for some shallow open water. Even frozen, overflow is not easy to navigate since the surface is not even and flat but rough, bubbly and very slippery. If proper precaution is not taken crossings can result in bad falls on hard surfaces. Creek banks can be very steep but are mostly less than a meter high. Once racers encounter the first big lake they are approaching CP 2. The long inclines are a good indication since they are inside of 6.5 miles of the CP. Dog Grave Lake will greet you at the top of one of the inclines and you will walk right into it. There is no chance to miss it since the trail does a sharp turn to the left right at the CP. This spot also marks the halfway point between Dog Grave and Braeburn. When Miketraveled this section a couple of years ago he found many tracks of big game, moose and bison. And he shared the trail with a wolverine for about 5 miles. It ran in front of his snow machine and was not willing to veer off to make room for him. Remember to keep your distance to all animals encountered! Pass information about animal sightings on to the guides on snow machines to warn others. The finishers get to rest here and will be transferred back to Whitehorse. We haven't got a transportation schedule as such. There will likely be at least one shuttle in the evening. If you miss that you might have to stay in Braeburn over night. That in itself can be quite an experience! 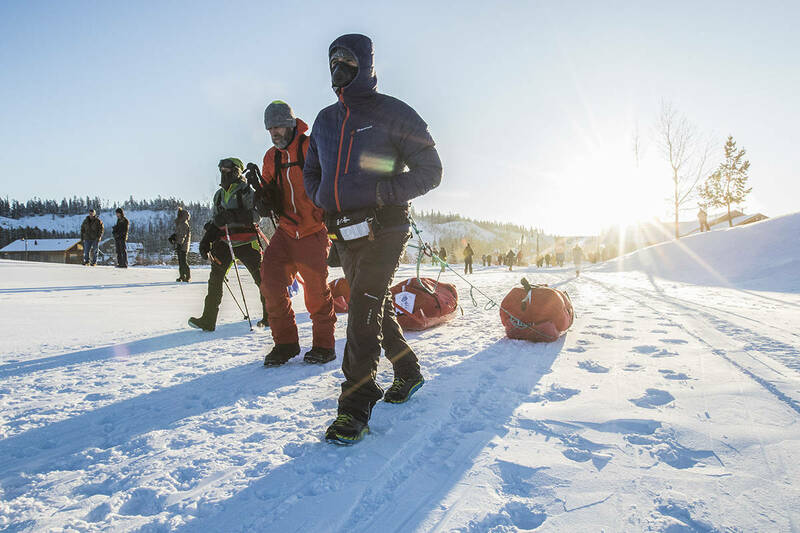 Because apart from mastering the challenges of the trail and the cold, it will be meeting the people of the Yukon that will make this trip such an unforgettable experience. Thetrail head is across the airstrip close to the right end facing it from the lodge. You start out on a driveway with tire ruts. When you find a sign indicating private property, the trail veers to the left and climb a good size hill. The first section is frequently open field and marsh, followed by a tight bush trail through the forest. Once you hit the first lake it will beintermittent lakes and forest. Both sections vary widely in length from a few hundred meters to several kilometers of lake or forest. lThe first large lake – Coughlan Lake – marks the half way point between Braeburn and Ken Lake. On the Lakes it is very important to stay on the trail. There are several places with possibilities for overflow and some lakes have "soft spots" in the ice which, if you travel across may break and you could end up in the water. Stay on the trail where it is safe. The Kruse family always welcomes the Quest musher. They serve warm drinks and food, and have a warm shack formushers to rest in. Since 2003 Jerry and Kathy Kruse have been hosting the Yukon Arctic Ultra, too. There will be a heated shed but no beds. So, you will need your sleeping bags. In Pelly Crossing we have used various locations as a checkpoint - depending on availabilty. We will let you know at the briefing which place it will be this time. In Pelly Farm we turn around and take the farm road. If the river can't be accessed on the way to the farm, it means you will go back the same way you came from. If you came to the farm on the river and travel back on the road it will be interesting. It's a different perspective and often the river is blocked from your view. When you see the bridge in Pelly Crossing you will know you are almost there! The following is Mike Simon's trail report from Pelly Farms to Dawson City – a trip which he did from February 25th to February 27th, 2006. Thanks Mike!!! There is high potential for overflow at miles 30, 33 (long), 50, 51.5, 56, 59 and 67. All above marks had frozen water on the surface with signs of mush or water around the edges. During my trip I could cross all of them without breaking the ice or hitting water. Caution is advised. At mile 40 I found a rough tent frame which could be made into an emergency shelter, unstaffed, by throwing a tarp over it and prepare some fire wood for the athletes. It is a nice spot with a view and easy to spot. This could also be the “hand over” place for the snow machine patrol. Section to here could be covered from Pelly Farm in under 3 hours and from here we could cover the trail from Scroggie Creek. The trail drops onto the river. To the left the "airstrip" was set up for planes to land near the cabin, the trail crosses the river and then turns upriver, to the right, on the far side. The trail follows the river past Maze Mae – Buildings are visible from the river, before it turns left onto land again. The river section was about 6 – 8 miles and is not always used. There is an alternate trail basically opposite from Scroggie Creek which passes through the woods behind Maze Mae (this is information from Ranger Mitch in Dawson). The trail is a small bush trail for a few miles and then widens into a "road" again. The trail follows mostly the middle of the open path. As of mile 87 I hit several places with glaciated creeks. In places those were more than a hundred meter wide and had sections with steep slopes. I had to pick my way carefully across to avoid the slopes but was able to make it easy enough. There was no overflow or open water at this time but the potential is there. Just when I thought the rough stuff was over, the trail turned of the road back up a mountain. This year the trail picked up the Ridge Road Trail, which is hated by the mushers for the steep side hilling. Again, sections with little shelter, trail is hard to make out and the wind swept snow is rock hard on the mountain slope. If somebody starts sliding they can easily go down 100 to 300 meters until they get stopped by the trees at the bottom. Getting back up would be very difficult. If I was on foot, I would not attempt this section without any kind of crampons.